I aspire to work not only as a professor with an active research agenda whose work contributes to greater understanding of human-environment relations, but as a leader on the topics of resource access, land tenure and food security. As an educator and researcher, I hope to guide students in their own academic pursuits to build their capacity to become future leaders in environmental research and activism. 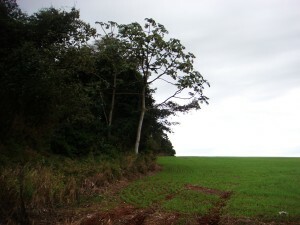 Resource access, land tenure and food security are extremely relevant in the Paraguay-Brazil borderlands because land-use change driven by expanding global demand for biofuel feedstocks has driven a rapid expansion in the production of soy (and to a lesser degree corn and sugarcane) in Paraguay, resulting in high rates of deforestation and increased environmental and social challenges for indigenous peoples there. Considering this situation, I am presently pursuing research related to the following questions – In what ways do agrofuel production in the Paraguay-Brazil borderlands impact human and environmental ecologies? How is climate change mitigation contributing to the neo-liberalization of nature and leading to new forms of environmental governance? How do these projects create challenges and/or opportunities for social mobilization and environmental equity on the part of indigenous peoples? This research is theoretically informed by contributions from critical approaches to human geography and critiques of development as well as political ecology. I am committed to supporting social and environmental justice through multi-disciplinary research, collaborative networks, and praxis. As such, I have spent much of my life learning about environmental degradation and social marginalization through professional work experiences and applied research. My commitment to finding ways to increase social and environmental justice through engaged research is informed by these experiences: working with community groups in Nogales, Mexico to identify alternative means to stem solid waste pollution by creating housing materials from ‘papercrete’, promoting sustainable agriculture in Southern Arizona, leading educational outreach trips to Kenya to teach about socio-environmental issues there, helping to manage a small non-profit responsible for operating an orphanage in Malindi, Kenya, investigating relationships between climate and vegetation in Tibet, researching the impacts and efficacy of Fair Trade for an indigenous producer group in Paraguay, and cycling 5,000 miles through South America to promote and raise funds for an education initiative in Paraguay. My experience as a Peace Corps volunteer in Paraguay, however, solidified my commitment to addressing these issues. During the two years I worked as an agricultural extension volunteer with the Peace Corps, I lived in a small, rural community and became deeply invested in issues of land politics, social mobilization, agriculture, food security, and development in Latin America. 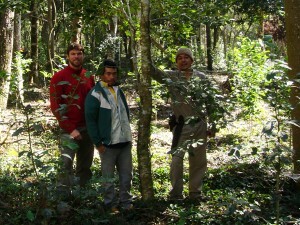 In a fair-trade certified yerba mate plantation in southeastern Paraguay during my M.A. 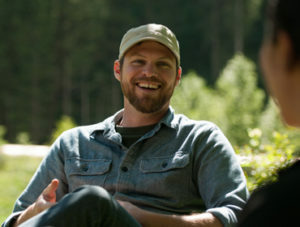 research in 2011. 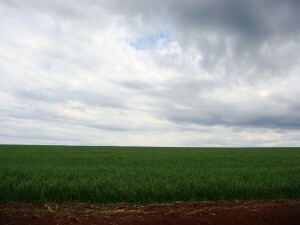 Much of the landscape in southeastern Paraguay resembles this photograph. The Interior Atlantic Forest has been drastically denuded for the expansion of large-scale agricultural production, principally soy. Many of the local farm families have been displaced for this mode of agricultural production. 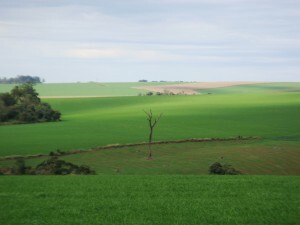 Where the forest ends and agro-export oriented agricultural production begins. Winter wheat acts as a cover crop for future plantations of summer soy destined for international commodity markets in southeastern Paraguay. 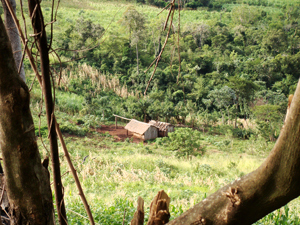 Traditional agriculture systems and a common-style house in a very remote area of central Paraguay. According to many estimates nearly all of the Interior Atlantic Forest in Paraguay has been cut down to make way for the expansion of the soy industry there. Winter wheat serves as a cover crop. 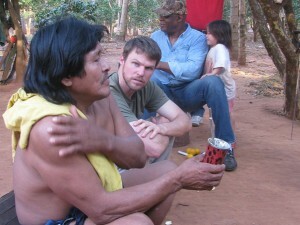 Listening to the leader of an indigenous community in southeast Paraguay during a meeting with a team from the Inter-American Development Bank that was investigating a land claim made by the community.